Occupation: Raira Academy 1st year works at a cosplay cafe. Physical Appearance: A slim girl that is smaller than most and harder to grab. Hair color/style: Brown hair which is put into two pigtails that are held into place by black ribbons, has hair antennae, and has little bobby pins in her hair. Clothes: At school she wears the Raira academy jacket over her black tank top and the blue skirt, when not at school she wears a black tank top with a cream colored scarf and black skinny jeans and black high top sneakers, and at work she dresses up as Moka from Rosario+vampire most of the time. Personality: She is cautious, when alone with someone she is often quiet, and when around many people she is hyper. She is shy around adults, she will try to answer in the least offense way possible, depending on the situation but sometimes she can't stop herself in time and may offend the person she sis speaking to, she jumps around a lot, and can seem annoying or eem odd when people first meet her. History: After she was born, her parents in America were killed and when a kind Japanese couple adopted her they brought her to their home in Ikebukuro, Tokyo, Japan. Her childhood with her parents was great, but in school, she was being bullied for being the teacher's pet and then was kidnapped when she was 10. She doesn't really have a religion. Strengths: Drawing, singing, history class, and science. Fears: Of going insane, of being forgotton by everyone, of not finding love, the fear of someone hurting her family, and of being alone. Likes: Sushi, dancing (not good at dancing), singing, pocky, western-world movies, the color yellow, she likes different types of music, likes ramen, likes romance books, sci-fi books, action book, reading, likes running around in the rain, and anime. Dislikes: Math, people she finds creepy, she dislikes the color gray, and she dislikes rap music. Mode of transportation: Trains, buses, or walking. Mannerisms: Chewing the inside of her cheek when she is bored and biting her lip when she is nervous. Other: She calls everyone older than her Sempai except for Teachers and her parents, and she often trips because of her lack of balance. I would like to see more detail on this app, namely in personality, history and other. Trying not to offend people and sometimes doing it anyways does not tell us what she's really like. Is she kind? Hateful, ambivilant, cheerful, hyper? Add more detail to those areas and we can accept her. Physical appearance: A tall girl that is big and sturdy. Hair color/style: Her natrual hair color is blonde. She died her blonde hair pink to rebal against her parents, the style of her hair is cut that goes along her jaw line (like a bob almost) with bits of her pink hair hanging in front of her left eye, she has a small black rose tattoo on her lower bac which she used a fake id to get, and has a gray earring (like masaomi's) on her left ear. Clothes: She wears hot pink sweater with white accents on it and the sweater reaches right below her upper chest. Her t-shirt under her sweater is white with red stripes and reaches right below her upper chest. She wears blue low-rise jeans that are baggy on her; she has a yellow rag that is tied to the left side of a loop on her pants. She wears a pair of black. Work boots, a hat that on the back is maroon, on the front has a picture of Kakashi Hatake from Naruto, and the bill of the hat is plum colored. Her school uniform is t Raira jacket with a black dress shirt, with a yellow bowtie replacing the red bow, with a navy colored skirt and a pair of black sneakers with white shoes laces, the sneakers that reach below her knees. Her graffiti tagger outfit is a black t-shirt with rips on it with a yellow t-shirt under it. A black skirt with black leggings and a pair of white sneakers, her face is covered with her yellow rag and her hair is put under a black hat so that only peices of her hair falls out. She also wears this outfit to yellow scarf meetings. Personality: She is smug and aggressive. She is mature at times because of her past. When people pick/beat on others, she doesn't like it and she will beat them to a bloody pulp. Altough she does things against the law and is violent doesn't mean she's a bad person she just is a rebal and free spirited. History: Her childhood was an odd one, with her mom always working and with her dad always drunk, she had to fend for herself like cooking and cleaning the house. When her mom would come home at night she would be in bed, did everything she had to, and even cooked dinner. This behavior took a toll on her school grades and she began to fail school. Do to her parents' absence she started tagging under the name raven to get attention, soon the nickname had gotten too many users so she changed to the tag name Razor. 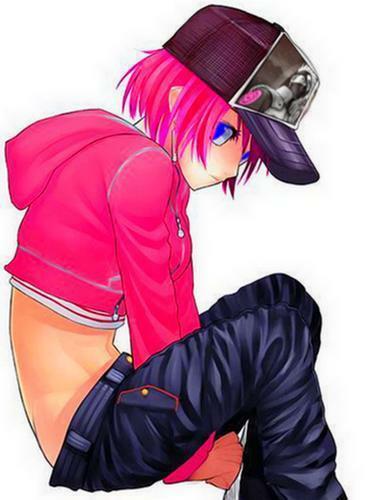 When she turned 14, she died her hair pink to see if her parents noticed but they didn't and when she liked the color she kept it and continued to dye her hair hot pink. After that, she joined the yellow scarves. She then went to Raira and got better grades because she worked harder. She got her ear piercing this year. Strengths: Graffiti art, running, and math. Weakness: History class annd lifting heavy things. Fears: Being buried alive, dying, and aliens. Likes: Graffiti aart, gangs, and the color pink. Dislikes: Death, sushi, the color black, and american music. Friends: Considers other taggers and gang members her friends. Mode of transportation: Walking and her pink bike (runs over people who make her mad). Mannerisms: Tapping her foot when waiting and grinding teeth when she's angry. Hair color/Style: Long black hair that reaches her waist. Clothes: A peach shirt with pink and purple dots, wears a yellowish-cream colored sweater, she wears a pair of blue jean shorts, and wears thigh-high boots with 2-inch heels, and when at school she wears the regular Raira outfit. Personality: A short-tempered girl when it comes to anything involving Yuuhei Hanejima, when not enraged about the celebrity she is a calm girl that can be talkative when starting a conversation. When people think she’s related to Yuuhei she stares at them, then tries to calmly explain and when that doesn’t work, she’ll scream and yell about how he isn’t related to her. Another reason she hates him is that she believes he’s a fake and a poser, many people say she looks like Yuuhei, which enrages her. When around fans of Yuuhei she will often shoot down they’re beliefs saying what a terrible person he is, and when alone she can seem eerie. When around her friends she acts calm but can be hyper if they start talking about anything she likes, she knows she comes off as eerie; she does it so she can keep people away when she's vunlnerable, she can be ver cocky when trying to show off to others mostly with boys, she is lonely some times because she doesn't have many close friends, and she is vain thinking she's beautiful and perfect. History: Ever since the rise of Yuuhei Hanejima, Nekiko has been mistaken as, the cousin or sister of Yuuhei because of her last name and her facial features which look like Yuuhei’s, she is often enraged by others confusion as a result she has developed a strong dislike to Yuuhei and anyone in any way evolved with him. Strengths: Reading, playing the piano, and painting. Weakness: She isn’t very strong, not good in certain classes, can't make good friends, and not fast. Fears: She’s afraid if she watches anything with Yuuhei in it she’ll like him and/or the movie and people she caes for getting hurt. Likes: Pocky, piano music, cats, and learning about famous painters. Dislikes: Yuuhei Hanejima, dogs, fans of Yuuhei, and people who think she’s related to Yuuhei, and having to watch movies involving Yuuhei Hanejima. Friends: People in her piano lessons and art class because she finds them interesting, she also hangs out with older students when she can, and anyone who can stand her temper. Mode of transportation: Walks or roller skates to school. Mannerisms: Face turns red whenever someone brings up the topic of Yuuhei. Other: In no way is she related to Shizuo and Kasuka. Her face turns red whenever she what? I believe your sentance cut off mid-way. She only considers people a friend if they hate Yuuhei? Is she extremely shallow? They could be the most irritating person on the planet but they hate Yuuhei so they are her friends? Please be more specific, it is okay to have friends that like a celebrity you hate, people aren't so shallow as to hate everyone who likes one actor or singer in specific for only that reason. I'd like to see an actual weakness on this character, liking pocky is not a weakness, an all consuming addiction to pocky is. Keeping her temper when people mention Yuuhei is more of a flaw than a weakness as well. She legitimately fears seeing a movie with Yuuhei in it? He's not scary, I can see her disliking it, I dislike watching movies with certain actors/actresses in them but I don't fear them because of one actor either. Please explain why she is actually afraid to watch a movie with him in it, is she scared she'll actually like him? Does she have a phobia concerning non-relatives with the same last name? Other than that, interesting concept, having a character share a name(stage name but still!) with someone famous can make for some amusing role-plays. It's highly unlikely that she would be 'frequently kidnapped' (and yes, almost on four seperate occasions is a lot). Besides that when someone say's 'no relation to so-and-so, lol' most people say 'Oh, okay, whatev's' not 'lol, you liar'. Aside from those points it's looking better! Physical appearance: Miyuki has black hair with dark, dark brown eyes. Her hair reaches her shoulders, which she puts in a side pony-tail. Her face doesn't attract people's attention. Her face is round and small, giving her cheeks a little chubby look perfect for pinching. Her cup size is a B but she's still growing. Her arms are slightly muscled. Her weight is 120 pounds and her height is 5 feet 1 1/2 inch. Her bangs are ragged and messy that hang in front of her eyes messily. When not in school she carries a light colored sweater with a cat face on it, she wears a red t-shirt, and dark blue pants. When in school she wears the normal Raira uniform. Personality: Miyuki is kind and isn't easily angered. When around her friends she acts happy and smiles a lot. When are others she usually tries to make friends. She's a follower and doesn't have the qualities of a leader, but if she tried to be a leader she'd fail miserably. When she has a crush on someone she stutters and blushes a lot. Miyuki is selfless when it comes to others, like if her friends were in danger she'd risk herself to help them. Miyuki will go with the flow of her emotions, like if she's sad she'll cry and she'll react accordingly to her emotions. She's extrovert when she's around her friends and introvert when around boys and adults. When she grows up she wants to become a writer. She wishes to find a boyfriend and raise a normal family. She is confident around her family and friends, but she's insecure around boys. She considers herself ugly because she isn't popular like other girls and doesn't get boys attention. If someone calls her cute she blushes, covers her face, and becomes clumsy. Background: Miyuki was born in Kyoto, Japan at age 5 her parents moved to Tokyo because her father found a better job opportunity. Then her mother gave birth to her brother. She was jealous of him when he was first born but she started to get used to him being around. When she turned 12 her confidence lowered because a boy said that she was ugly and plain. Her father is a banker and her mother is a stay at home mom who works from home. Her mother's job is a website programmer. Her life with her parents is good; sure, they fight every once in awhile but that is normal. Her mother is pregnant and Miyuki has a little brother that she fights with when he makes her mad. Her mother had always told her as she grew up, "Always treat those with respect and be a nice girl everyone loves that." That has helped shaped her into the young adult she is. Her fear of becoming a drug addict comes from a time when she was 14 and was pressured into trying drugs by her friends. She smoked pot and after that one time she never did it again because she saw what it did to her friends and was scared she'd become an addict who hid things from their families. Her mind is still plagued by the dark feeling of doing drugs. Strengths: A grade higher in education. Weaknesses: not fast, not strong, and easily swayed. Fears/Insecurities: Her family is going to be hurt, drowning, clowns, getting stabbed, becoming a drug addict. Likes: Books, animals, and cute things. Dislikes: Awkward moments, drugs, war, death, pain, and gangs. Driving force: Finishing school, going to collage, and then getting a good job. Hobbies: Reading, walking, swinging on a swing, hanging out with friends, and helping animals. Describe your character in three words: Average, kind, and caring. If your character were stranded on an island and could only bring two things with them, what would they be? : A book and a swing set. If your character could change anything about themselves, what would they change? : Her looks, she wishes she could be pretty and make boys love her. Miyuki sighed as she walked down the street. " Just another day for an average girl." She kept walking and skipped a little on her way to school and fixed her collar on her shirt. She moved her dark bangs out of her eyes trying to look nice. "Maybe today's the day I'll find love...I hope." And with that she walked into the school hoping for an average day. Please define 'normal body of a normal japanese teen' there is not really something people can consider 'normal' what's her cup size, her facial structer, etc? I'm not picturing her very well... in fact I barely have any concept of her physical appearance! Please be more descriptive on her physical appearance. Reading at a higher grade level is usually indicative of intelligence, you can give her some strengths! Why is she afraid of becoming a drug addict? Is someone she loves one? Is she doing drugs secretly? I don't take them and I'm not afraid of becoming one because I know I won't ever take them so don't use the 'well she doesn't use them so she's afraid' as an excuse, there could be some potential there! You use the word average a little too much through the entire application. we get it, she's average and yes we like that but you don't need to stress it so much! I'd love to see her hopes and dreams listed in personality, what does she want to be when she finishes school? does she wish she had a boyfriend? Is she confident? unconfident? Does she have low self esteem? Consider herself ugly when she might not be? I can't wait to see the edits and learn a bit more about her, she actually interests me a lot with how normal she is and it makes me happy to see a character like this. Please post in the thread when the edits are complete. Is it ok if I change Miyuki's school grade to 2nd year?